Imprint - 1: Remove target creature card in your graveyard from the game. (The removed card is imprinted on this artifact.) 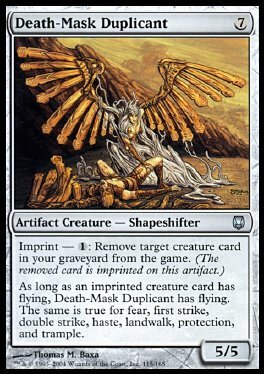 As long as an imprinted creature card has flying, Death-Mask Duplicant has flying. The same is true for fear, first strike, double strike, haste, landwalk, protection, and trample.